The staff of the Parish of St. Fabian, Pope and Martyr, attended a recollection last 27 March 2009, intended solely for the parish workers and personnel of the different parishes of the archdiocese . The recollection was a request from the priests who noted the need for their staff and personnel to undergo spiritual formation. 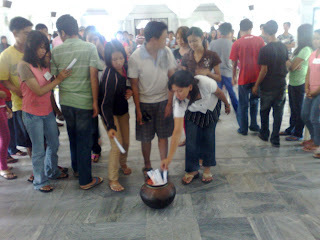 The one-day recollection was held at the Lay Formation Center of the Archdiocese. Fr. Mario Dominic C. Sanchez facilitated the recollection. 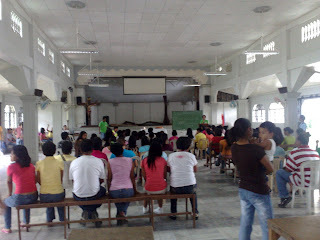 Seven parishes sent their office and other personnel to attend the said recollection. 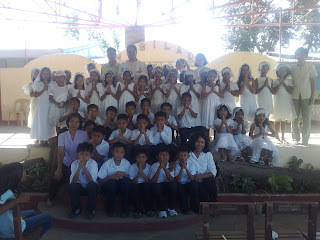 They were: St. Dominic Parish (San Carlos City), St. John the Evangelist Parish (Dagupan City), Epiphany of the Lord Parish (Lingayen), Our Lady of the Most Holy Rosary Parish (Calmay), Parish of St. Fabian, Pope and Martyr (San Fabian), Holy Family Parish (Santa Barbara) and Sts. 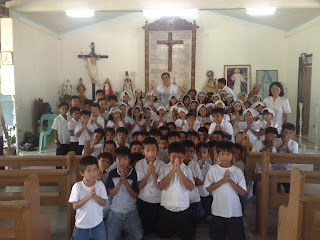 Peter and Paul Parish (Calasiao). The Recollection is highlighted by three conferences on life, God and happiness. The Sacrament of Reconciliation and the Eucharist were the culminating activities. The staff and personnel who attended the one-day recollection from the parish were: (front) Ms. Heidi Tibigar and Ms. Marie Lopez (Parish Secretaries) with Fr. Mario Dominic C. Sanchez. (back) Mr. Fortunato Albay (Gardener), Mr. Jeffrey Billosillo (Rectory Personnel) Mr. Leo Costes (Driver and Cook), with Mr. Mark Navarro. In a circular letter addressed to the parish priests and chaplains of the Archdiocese of Lingayen-Dagupan, Msgr. Renato P. Mayugba, DD, the Auxiliary Bishop, issued an invitation to the devotees of the Divine Mercy to the 2nd Archdiocesan Congress on The Divine Mercy. In his letter, the bishop, to show the significance of the octave of Easter, wrote that “on the octave of Easter, Christ appeared again to the eleven and, calling the attention of Thomas, showed his wounds that wrought our redemption”. The program will have three major talks on the Divine Mercy. The first talk on "Divine Mercy in Scriptures" will be given by Fr. Oliver E. Mendoza. "Pastoral Implications of the Divine Mercy Devotion" will be shared to the participants by Most Rev. Jesus A. Cabrera, DD. The third talk on "Celebration of God's Mercy " will be given by Most Rev. Renato P. Mayugba, DD who will also celebrate the Mass on that day at the Parish Church of St. Thomas Aquinas. "In the evening, when I was in my cell, I became aware of the Lord Jesus clothed in a white garment. One hand was raised in blessing, the other was touching the garment at the breast. From the opening of the garment at the breast there came forth two large rays, one red and the other pale. In silence I gazed intently at the Lord; my soul was overwhelmed with fear, but also with great joy. After a while Jesus said to me, 'paint an image according to the pattern you see, with the inscription: Jesus, I trust in You.'" "The pale ray stands for the Water which makes souls righteous; the red ray stands for the Blood which is the life of souls. These two rays issued forth from the depths of My most tender Mercy at that time when My agonizing Heart was opened by a lance on the Cross....Fortunate is the one who will dwell in their shelter, for the just hand of God shall not lay hold of him." 28 March – San Fabian. As part of the continuing restructuring of the Archdiocesan Social Action Apostolate (ASAP) of Lingayen-Dagupan, the Vicariate III (Queen of the Most Holy Rosary) held a meeting of all the members of the different parish social action apostolates. 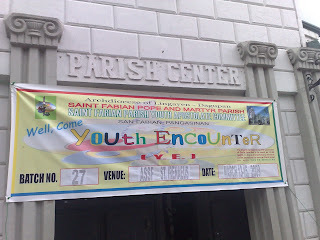 It was held at the Parish Center of the Parish of St. Fabian, Pope and Martyr. The participants of the meeting were the different Parish Chairpersons, the Secretaries, Treasurers, BEC and Youth Coordinators, the Caritas, Advocacy and Justice and Peace Ministries coordinators. 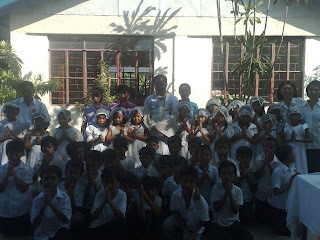 The Archdiocesan Social Action Apostolate Director, Fr. 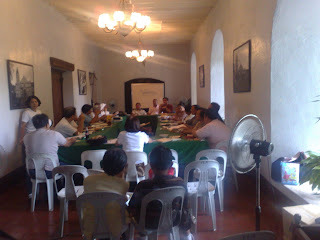 Oliver E. Mendoza, presented and explained to the body the Parish Social Action structure. Sis. Janice R. Hebron, the Archdiocesan Social Action Lay Coordinator facilitated the different activities and sharings of the different parishes. The Vicariate 3 Social Action Lay Coordinator is Bro. Antonio Supremido. The next phase of the continuing program is the Vicariate Assemblies. The scheduled date of the Vicariate Assembly of Vicariates 1 and 2 will be on 9-10 May 2009 at the St. John’s Cathedral School, Dagupan City. The different parishes of Vicariate III are St. Thomas Aquinas Parish (Mangaldan), Parish of St. Fabian, Pope and Martyr (San Fabian), Most Holy Rosary Parish (Manaoag), St. Hyacinth Parish (San Jacinto), St. Joseph, the Patriach Parish (Mapandan), Holy Cross Parish (Laoac). 22 March – San Fabian. The “Divine Mercy Newsletter” is already out for distribution and for reading by the devotees. The newsletter is a publication of the Apostles of the Divine Mercy of the Parish of St. Thomas Aquinas, Mangaldan, Pangasinan. It is being distributed however for the whole Archdiocese. It usually comes out before Holy Week, and in time for the celebration of the Feast of Mercy on the first Sunday after Easter. This year, the Feast of Mercy is celebrated on April 19. The newsletter highlights the following: updates on the celebration of the 2nd Congress on Divine Mercy as well as updates on the celebration of the Mercy Sunday. To download and read the Newsletter, kindly click the link: Divine Mercy Newsletter Vol.4,1 It is in the .pdf format. 22 March – San Fabian. 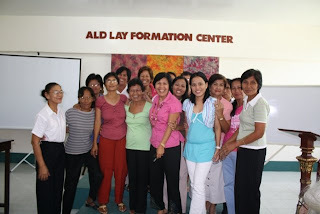 The Lay Eucharistic Ministers and the Lectors/Commentators of the Parish had their annual recollection at the Lay Formation Center last 21-22 March 2009, respectively. The recollection is part of the continuing formation program of the lay ministers in a directive by Archbishop Oscar V. Cruz, DD contained in his circular (Circular Letter 4, Series 2009). Rev. Frs. Mario R. Morales and Mario Dominic C. Sanchez facilitated the recollection. It was held at the Lay Formation Center of the Archdiocese. 22 March – San Fabian. Bro. Estephen Espinoza, a seminarian of the Archdiocese of Lingayen-Dagupan, has been assigned in the Parish of St. Fabian, Pope and Martyr. Bro. Estephen hails from Lingayen, Pangasinan. He finished his High School studies at the Mary Help of Christians High School Seminary. He obtained his AB Philosophy at the Mary Help of Christians College Seminary, Bonuan Gueset, Dagupan City. He finished his Theological studies at the Immaculate Conception School of Theology, Vigan, Ilocos Sur. Bro. Estephen is staying in the parish as part of his continuing formation to the priesthood. He arrived in the parish last March 14. The Flames of Mercy are Burning! The First Archdiocesan Congress of Divine Mercy was celebrated last 21 June 2008 at the Parish of St. Fabian, Pope and Martyr. During that congress, there were about 600 devotees who took part in the said congress. Majority of the delegates came from the host parish of St. Fabian and the neighboring parish of St. Thomas Aquinas Parish in Mangaldan, Pangasinan. These two parishes have the most number and active devotees of the Divine Mercy. It is expected that more devotees and parishes will take part in the second congress. Three talks are to be shared during the day: Divine Mercy in Scriptures by Rev. Fr. Oliver E. Mendoza, Divine Mercy Spirituality by Most Rev. Jesus A. Cabrera, DD and Divine Mercy and the Church by Most Rev. Renato P. Mayugba, DD. Registration starts at 7:30 AM. The program and activities will end by 4:30 PM. Participants are advised to bring their baon. 15 March - San Fabian. The Parish Youth Apostolate Council conducted two Youth Encounter weekend seminars last 27 February to 1 March, and 13-15 March. The YE weekend seminars were given to the Fourth Year graduating classes of the Archdiocesan School of San Fabian (ASSF), Sts. Iraneus and Francis. Another YE weekend seminar is scheduled on 27-29 March. The Archdiocesan School of San Fabian will hold its graduation exercises for the High School Department on 3 April 2009. Graduating Fourth Year students of the Archdiocesan School of San Fabian in one of the activities of the Youth Encounter weekend seminar. 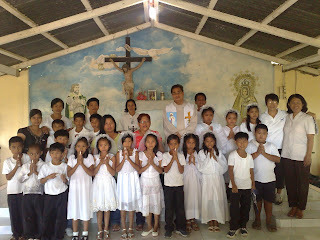 The participants in a mass celebrated by Rev. Fr. 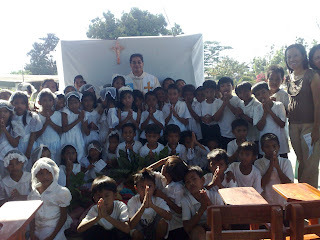 Oliver E. Mendoza, Parish Priest and Director of ASSF. 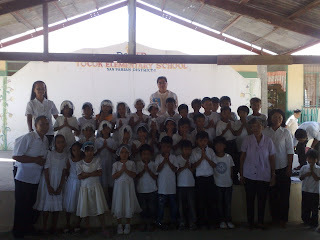 First Communicants of Tocok Elementary School. 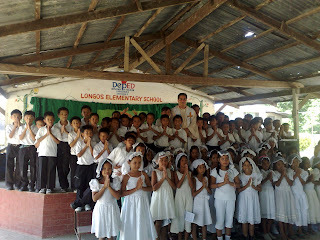 First Communicants of Longos Elementary School. San Fabian - 5 March. The Parish of St. Fabian hosted the regular meeting of the Board of Directors of the Northern Luzon Commission on Biblical Apostolate last 2 March. The meeting formally opened at 2:00 in the afternoon. It was presided by Msgr. Renato P. Mayugba, DD, the Auxiliary Bishop of Lingayen-Dagupan, and the Regional Chairman of the Biblical Apostolate. It lasted until about 7:00 PM. The Northern Luzon Commission on Biblical Apostolate is one of the many commissions established by the bishops of Northern Luzon. Northern Luzon is composed of three Archdioceses, and eleven dioceses. The NLCBA is the coordinating body of the biblical apostolate. The meeting was attended by the different Biblical Directors of the dioceses together with their Lay Coordinators. Representatives from the Philippine Bible Society were also presetn. One of the things discussed was the program of the Episcopal Commission on Biblical Apostolate to give one bible to every Filipino family in the whole country. Fr. Fidelis B. Layog is the Archdiocesan Biblical Apostolate Director. Sis. Silvana M. de Vera of the Archdiocesan Biblical Apostolate is a member of the Board of Directors of NLCBA. San Fabian - 2 March. The Liturgical Greeters or more popularly called the Usherettes and the "Colecta" team attended a one-day Recollection at the Lay Formation Center of the Archdiocese of Lingayen-Dagupan last 1 March, Sunday. 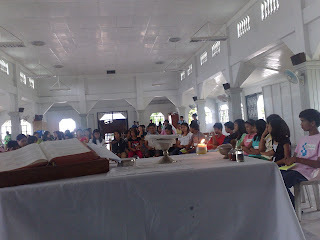 The recollection given to the group is part of the Formation Program being followed by the Archdiocese of Lingayen-Dagupan which is given to the different members of the Parish Ministries which include, besides the Liturgical Greeters, the collecta teams, the members of the Parish Choirs, the Lectors, Commentators and the Lay Eucharistic Ministers. This was contained in a Circular Letter (Series 2009, No. 4) signed by Archbishop Oscar V. Cruz, DD in a directive to the clergy of the Archdiocese. San Fabian -2 March. 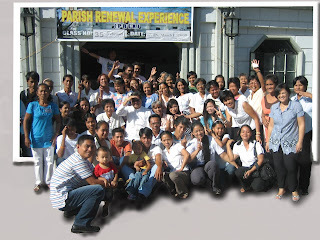 Parish Renewal Experience (PREx) Class 35 was recently held at the Parish Center last 27 February to 1 March. 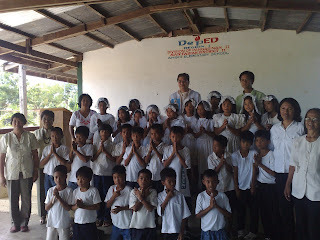 There were 30 graduates of this class coming from the different communities and barangays of the parish like Barangays Lipit-Tomeeng, Sobol, Cayanga, Sagud Bahley, Nibaliw Center, Anonang, Tempra-Guilig. Class 34 sponsored the weekend seminar. Chosen as the Class Coordinator was Sis. Fina I. Ibasan of Nibaliw West and the Assistant Coordinar was Bro. Roberto A. Ymana of Barangay Sobol. Rev. Fr. Oliver E. Mendoza with Sis. Ma. Rowena A. Nicer and Sis. Shirley Tersol gave the talks/reflections. PREX Class 35, Faith Family 1 (Not in order): Leonida Disu, Daisy Pedrasa, Paul Julius Soliven, Maricar Alcantara, Etang Percil.